When we meet this time next year let it be as a Labour government. He also claimed his party could seize power in Downing Street within months. “When we meet this time next year let it be as a Labour government,” he said to rapturous applause from hard-Left actitvists on the final day of the conference in Liverpool. 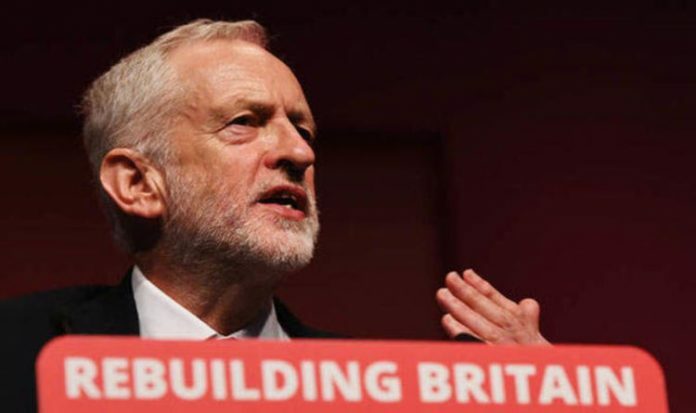 Mr Corbyn’s hour-long speech threatened a radical transformation Britain’s economy with a massive extension of state control of industry and a huge spending splurge on the NHS, local councils and social security to end years of “austerity and neglect”. He dwelt on his favourite international causes in Yemen, Burma and the Middle East, with delegates waving Palestinian flags when he vowed that a Labour government under his leadership would immediately recognise Palestine as a nation state. But he once again declined to apologise for the anti-Semitism row that has raged within his party. Critics last night warned that his vision for Britain offered nothing but economic chaos and swingeing tax rises. Tory chairman Brandon Lewis said: “Jeremy Corbyn has shown at every turn he is unfit to govern. “All he offers are failed ideas that didn’t work in the past and would leave working families paying the price with higher taxes, more debt and more waste – just like last time. “He confirmed Labour are opening the door to re-running the referendum, which would take us all back to square one. Mr Corbyn signalled his hunger for power by delivering his most polished conference speech with fewer rambling passages than in the past. Thousands of Left-wing activists at the ACC Liverpool convention centre showed their adoration for the career-long socialist hardliner by punctuating the address with more than 100 bursts of applause. They welcomed their leader onto the conference platform with chants of “oh, Jeremy Corbyn” and he joined their applause as he walked up to the lectern. Shadow ministers joined him on the platform in a show of unity, although deputy leader Tom Watson – a critic of Mr Corbyn who was denied a speaking slot in the conference hall – was absent. Setting out his strategy for seizing power, the Labour leader pointed towards votes on Brexit expected in the Commons this autumn. “Let me say to the country – as it stands, Labour will vote against the Chequers plan or whatever is left of it and oppose leaving the EU with no deal. “And it is inconceivable that we should crash out of Europe with no deal – that would be a national disaster. “That is why if Parliament votes down a Tory deal or the government fails to reach any deal at all we would press for a General Election. Failing that, all options are on the table,” he said. Mr Corbyn also mockingly offered to support Mrs May if she came up with a Brexit deal that met Labour’s demands. “Let me also reach out to the Prime Minister, who is currently doing the negotiating. “Brexit is about the future of our country and our vital interests. It is not about leadership squabbles or parliamentary posturing,” the Labour leader said. Mr Corbyn repeatedly tore into the Tories as the “party of the rich” during his speech. He acknowledged the anti-Semitism row had led to a “tough” summer for his party. “The row over antisemitism has caused immense hurt and anxiety in the Jewish community and great dismay in the Labour Party. “But I hope we can work together to draw a line under it,” he said. “We will work with Jewish communities to eradicate antisemitism, both from our party and wider society,” the Labour leader said without offering an apology for the anger and distress caused by the row. He claimed “race hate” was a “growing threat” across Europe resulting from the “far-Right” blaming minorities for “the failures of a broken economic system”. Hitting out at Boris Johnson, he accused the former Foreign Secretary of making “disgraceful dog-whistle jibes at Muslim women” after his criticism of burkas. Mr Corbyn claimed “eight years of austerity” had left local councils “teetering on the precipice”. “This Government must be held to account for their social vandalism,” he said. “We will rebuild the public realm and create a genuinely mixed economy for the 21st century. “And after a decade of austerity, the next Labour government will confront the challenge of rebuilding our public services,” the Labour leader said. Mr Corbyn, quoting from the Labour icon Aneurin Bevan, hailed the NHS as “pure socialism”. He claimed the Tories had “pushed our NHS to crisis”. “Labour is ready to put fairness and humanity back at the heart of our public services,” he said. He went on to promise to put an extra 10,000 police officers on the streets and fund “the biggest home building programme in half a century” while saying little about how a Labour government would raise the cash for the huge hike in spending. “Labour is offering a long overdue change that will transform people’s lives and meet the needs of a 21st century Britain for all,” he said. Mr Corbyn blamed the financial crisis that happened a decade ago under the last Labour government on “greed-is-good deregulated financial capitalism”. He claimed Labour’s task was to rebuild Britain, ending: “Together, we can”. After his speech, delegates clapped along as the public address system in the conference hall blasted out Children of the Revolution by T-Rex. Mr Corbyn sang along with the 1970s hit. Later, the conference closed with the traditional singing of the socialist anthem The Red Flag, with delegates accompanied by the Liverpool People’s Choir. Critics last night said the Labour leader’s hard-Left blueprint had little to offer for businesses and millions of middle-income households. John O’Connell, chief executive of the TaxPayers’ Alliance pressure group, said: “Corbyn’s angry rant offered nothing to the hard-pressed, silent majority of taxpayers who want to be trusted to spend their own money and care for their children as they see fit – without being clobbered by even more cruel punishment taxes. “Millions of taxpayers will be left picking up the pieces – and the bill – when his failed ideology yet again wrecks the economy, and his bizarre crackdown on business will drive investment away precisely when Brexit Britain needs it most. Dr Adam Marshall, director general of the British Chambers of Commerce, said: “Jeremy Corbyn missed a golden opportunity to extend an olive branch to British business, big and small alike. Stephen Phipson, Chief Executive of EEF, the manufacturers’ organisation, said: “The private sector plays a huge part in creating wealth which helps ensure we can improve vital public services across the UK. “It must not be over regulated. Too much interference will stifle growth and not help tackle the productivity gap. Mr Corbyn also used his speech to finally acknowledge for the first time that Vladimir Putin’s Kremlin regime was almost certainly behind the Salisbury nerve-agent poisoning earlier this year. “We are entering a new fast-changing and more dangerous world including the reckless attacks in Salisbury which the evidence painstakingly assembled by the police now points clearly to the Russian state,” he said. The remark was being seen at Westminster last night as a desperate attempt by the Labour leader to depict himself as a statesman ready to take charge in Downing Street.